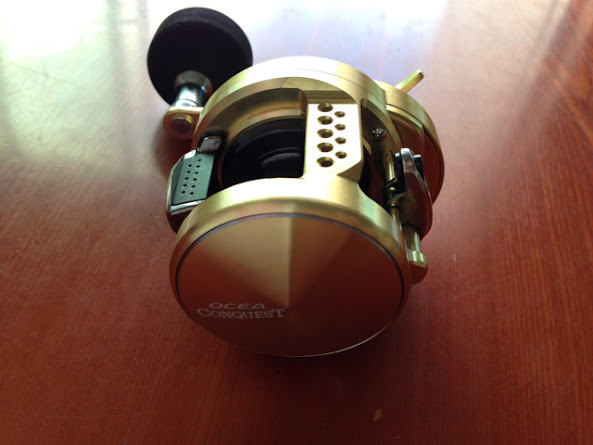 This reel was launched hot on the heels of the successful 2014 Shimano Calcutta Conquest and it looked like other than a longer handle with an oversized EVA knob and a higher gear ratio, this reel must have been borrowing heavily from the 2014 Conquest’s parts bin… Or is it? 1. I want to upgrade the bearings high performance ones. Where can I get them locally ? 2. Can I upgrade the drag ? It's a Jigging reel, so IMO, the spool bearings are more than adequate. You can change the bearings to after market ABEC 7 or Ceramic bearings. But note that the handle is not ideal for casting. It may swing forward and engage gear in midcast. When that happens, you either bust off, or the lure can be jerked back and fly at you with all the sharp hooks coming your way. But if you still wanna change bearings, you might wanna contact Daryl Quah (DazTackle) for Hedgehog bearings. You can also try Lure Haven. The size for your spool bearings are 10mm x 3mm x 4mm thick. The Ocea Conquest drag is a carbon cloth material, very similar to Carbontex. With a thin coating of Cal's Grease, you should get smooth and consistent drag pressure, so changing it is unnecessary. But if you really need to change it, you can also change the discs to Carbontex. However, you gotta order it from Dawn@Smoothdrag.com. That's because the discs are very thin. Just write to her. She is very helpful.